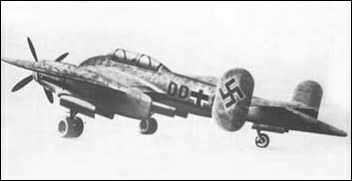 A 1942 development of the Ar 240, abandoned on favour of the Do 335. A general-purpose twin-engine, enclosed tandem two-seater. Only four were built. Armament: 2 x 7,92 mm MG 17 in wing root, 2 barbettes F 13, dorsal and ventral with one 2 Mg 81 7,92 mm each.